Earlier in the week, the Republican Study Committee (the caucus of House conservatives) issued a press release calling BP's decision to open a $20 billion escrow account to compensate Gulf residents hurt by the BP spill a "Chicago-style political shakedown." Rep. Tom Price (R-GA), chairman of RSC, commented, "in an administration that appears not to respect fundamental American principles, it is important to note that there is no legal authority for the President to compel a private company to set up or contribute to an escrow account." 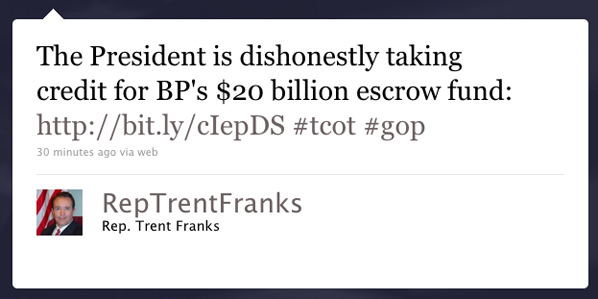 Now, Rep. Trent Franks (R-AZ), another member of the RSC, is attacking President Obama from a different angle. In a press release, Franks does not accuse the White House of a "shakedown," but rather blasts the president for his supposed dishonesty in taking credit for the creation of the escrow account. "However, the real story here is that BP had already made the decision to set aside $20 billion to compensate those harmed by this tragic disaster several days prior to the President's speech. The true outrage is that this was never the President's idea at all, and he should be ashamed for pretending it was for political purposes." Which is it? Did the president forcefully shakedown BP or is he dishonestly taking credit for something BP had already committed to? It can't be both.